Puppies are so cute and most of the people often want to take one in their home. There is no doubt that pet owner should take care of them carefully. In this article, I want to mention another minor thing in the process of raising a small dog. When you need to go out, you could bring your pups. But how could you take them along with you? Do not say that you will get them inside of you! In this case, a dog cage is likely a good idea. This is what I mean! 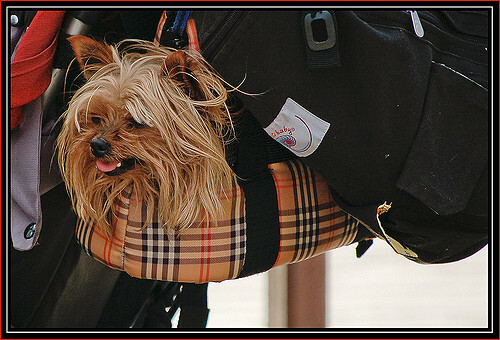 Do you know pet purses for small dogs? Although a crate carrier is not a commonplace product for transporting, it is suitable for heavy small dogs. Also, it protects your pups better than you do not take any protective gear for them. Crate carriers are usually made with soft sides and sturdy plastic. These used materials are appropriate when you bring them to the airlines in the domestic and international pet travel. Your pups are safe when some airlines require pets should be put another place (near the suitcase zone). Generally speaking, crate carriers are accepted by most airlines that passengers can take these under their seats. In the backpack carrier, you have 2 main options. The first one is where your pups face forward and the second is taking their face in the rear. Most of the backpack carriers give hands-free features for users. The downside of this type is that you cannot realize what your dog is doing. Thus, you need to read the manual to ensure your pet is safe when putting them in a backpack carrier. Tote carriers have the similar tote bag for humans that you can wear these on your shoulders. Zippers often place in the windows or openings where your pups enable to stand their head out. These carriers are ideal for all sizes of pups no matter how heavy or lightweight they are. Some tote carriers ought to keep pooches from up to 18 pounds and some even withstand fatty pups with 30 pounds. A good tote carrier is catching 2 main things. You can handle the product as easy as a pie and your pup’s weight is available on your single shoulder only. I like the wheeled carriers because I can pull the cage when my hand muscles are tired and my pups are becoming heavy. I cannot wear the bag on my shoulder! With a wheeled carrier, I just pull it like I am carrying my lightweight luggage bag. Furthermore, a wheeled carrier is also like a backpack and a suitcase-style at the same time. It sounds cool, isn’t it?! In the front carriers, there are 2 major types – the infant style and the pouch one. It would be nice when your pups do not get any health issue on their backs as you can choose the infant or the pouch. However, when they have back troubles, avoid using the infant carriers because these can make their issues more awful. Some brands also produce another style of the pouch namely the pet sling. It is also called the shoulder carrier. Though pet purses are a set of fashionable accessories, they are not really simple to scan your cards and take a new one only! You need to get some choosing tips for reviewing some brands. And I will help you giving lots of tips in advance (I will take my reviews in another post). One of the most important parts of figuring out the best carriers for your pups is choosing a tote which is the right size. Please bear in mind that two dogs do not have accurate size even if they are twins. This is a hard trick to meet the requirements as you need to estimate or even calculate the dog’s size before shopping around. When it comes to the height of a dog carrier, it should be considered to the top of the dog’s shoulders rather than their heads. Mostly, all airlines have to show this point on their regulations because they have limited space. It is a perfect bag if the size fits space on the airplane and your pups still feel comfortable at all. If you are going to buy a dog carrier in this season, you will need to spend some bucks but think of the number of bucks you have to pay. Does it deserve? Is it great for money? I am talking to the quality of the product. A top-notch carrier quality is a worthy investment that everyone expects to. In addition to, the used material is also important to prove the quality of a dog carrier. Check the bags with strong handles and solid bottoms may create a high-quality cage. Mesh and fabric are also good materials to help your pups feel comfortable and safe. As mentioned earlier, the carrier has 5 main different types that you and others can choose from. Set dog’s needs and your activities which you will wish to carry pups with you. Shape, colors, and model are also vital but do not place these aspects on the top priorities once think of a carrier. Select the one that you and your pups feel convenience completely. You enable to travel with your lovely pet, but some airlines still have their own etiquette and regulations. For example, they do not allow a big carrier or a heavy one to keep their limited space. In other words, the size matters for most of the airlines when carrying out a pet. Therefore, you should contact them and review all regulations before booking your ticket. There is no denying that a dog cage is useful for traveling. However, all pup’s owners should take further information behind the story. It is not simple like a pupil write his name on the white paper!